Truth be told, we’ve done a lot of budget drones lists on this website… but none of them goes quite as low as this one. Sure, we had Best Drones Under $100 which features some of the best up and coming beginner-friendly drones out there… but this list takes the whole „low budget“ thing much further. 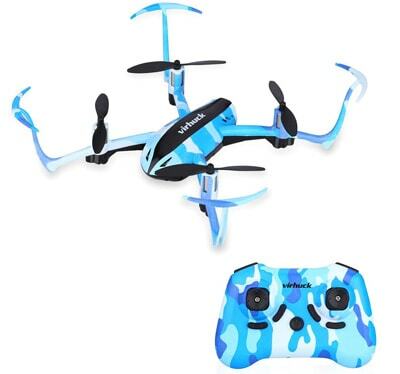 You see, today we are going to focus on the TOP 5 drones under $20. Yup, you read that right – we are going to be looking at drones that cost less than your average restaurant meal. But, do we have a lot to work with? Well, honestly… you’d be surprised at how many models are available for less than $20. So, with that said, we should probably head on straight to the list. But, before that, I’d first like to take you through a couple of sections dedicated specifically to these cheap drones. You’ll be able to learn more about them which will, hopefully, allow you to make a better decision when purchasing one for yourself. Finally, we are done with all those introductory sections and ready to move onto the real deal. 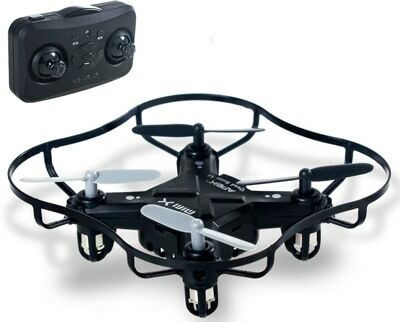 So, yeah – there are 5 awesome quadcopters under $20 waiting for you down below. 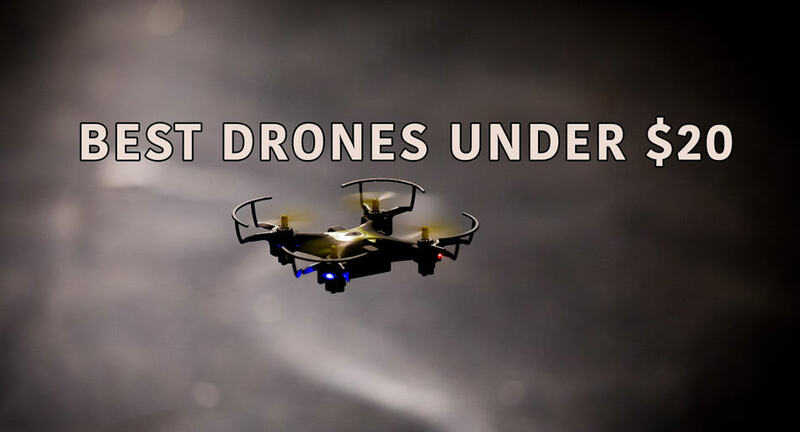 Each of them is thoroughly described so you know what you’re getting for your money… It’s time to see what is the best drone under $20 ! I decided to start this list off with a rather interesting little fella. It goes by the name Luxon Quark and comes with a whole set of additional accessories. These include not only extra propellers (whopping 8 extra propellers for that matter), but a prop protector as well. 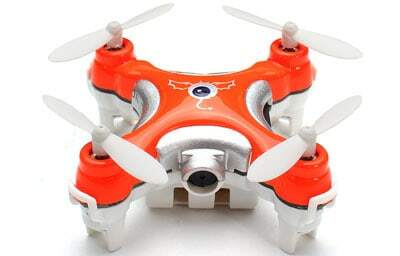 Additionally, you’ll also get a rolling frame which will turn your mini drone into a lightweight RC car. Pretty neat if you ask me! But, the real question is – does Luxon Quark has anything else neat about it? Well, starting off with its features, there isn’t much to tell you about. You see, this little birdie only incorporates LED lights and 3D flips. On the bright side, it comes with a solid controller that has intuitive controlling schematics and works up to 30-50 meters away. Stability-wise, my recommendation is that you keep this little bugger indoor at all times. When it comes to flight duration, Luxon Quark actually does pretty fine. It takes only 30-35 minutes to charge. What’s best – you’ll be getting around 6-8 minutes per charge which is absolutely praiseworthy at this price point. All things considered, with a bunch of accessories, great specifications and controller, Luxon Quark deservedly sits at the 5th spot. Virhuck T915 is a beautiful drone. Come to think of it, If I was to pick a drone out of this 5 with beautiful design being the only corresponding factor, there’s no doubt this one would be my pick. It sports a shiny black and yellow combination together with raised prop guards for increased protection. Also important – there are bright LED lights for night flying sessions at your disposal. They’ll surely allow you to boost your drone’s visibility if you plan on flying it outdoor… even more so during the night. Other than that, Virhuck T915 actually has a great set of features at its disposal. Not only does it have headless mode but it also has one key return to home. It’s not precise as premium models, but it will get the job done more often than not. Furthermore, VIrhuck T915 also has access to 3 speed modes (slow, medium and fast). Obviously, this is great for first time flyers as they’ll get an extra level of adjustability for their first flying steps. However, the range of this baby is close to 50 meters. Combine that with decent stability which allows it to be flown outdoor too, and you’ll realize what a steal this bad boy is! The golden middle of this list belongs to a rather popular model. Well, not quite as popular as the one following it (Cheerson CX 10), but still, JJRC H36 has had its fair share of sales too. Why is that so? 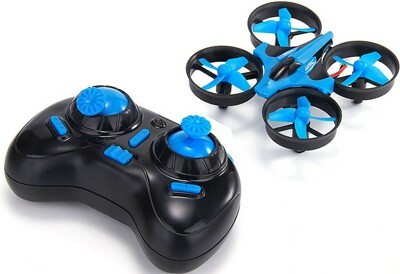 Well, it’s mostly due to the fact this mini drone is well-built. Plus, it has uniformed propeller protectors that are thick and cover all 4 propellers. But, is the build quality all JJRC H36 has in its favor? Not by a long shot! In addition to awesome build quality, JJRC H36 can also brag about its fine set of features. Similarly to Virhuck T915, this birdie also has headless mode and one key return. LED lights are there as well, and so is 3D roll function which will surely please children of all ages. In terms of stability, JJRC H36 looks pretty good. Even though it isn’t flyable during mild winds, it can serve as a great outdoor training drone at calm weather. Specifications-wise, you’re looking at roughly 5 minutes of airtime. That’s pretty good considering it takes about half an hour to fully charge this baby. Last but not least, JJRC H36’s operating range hovers around the 30-meter mark. While that won’t cause you any issues indoor, for outdoor use it might be just a bit too short. Cheerson CX 10 is, by far, the most popular drone out of all drones under $20. As a matter of fact, I’ll go out on a limb here and say that it’s the drone that started this whole under $20 thingy. And, you’ll realize at the end of this description, Cheerson CX 10 does have a certain charm to it. Let’s kick it off and see what’s this runner up all about! First things first, let’s talk a bit about the controller. 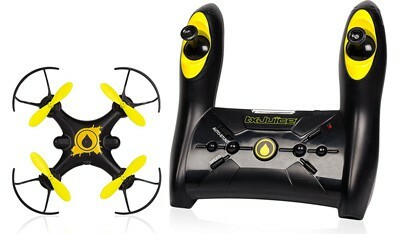 Rotating sticks are pretty well built and provide decent tactile feedback which is crucial for your flying experience. It’s not that big though so people with large hands (such as me) will have troubles with aligning their thumbs at first. When it comes to features, Cheerson CX 10 incorporates 3 speed modes and 3D tumbling button. There’s no return to home here so you’ll have to manually retrieve this puppy if you’re getting short on battery juice. For those of you wondering about its specifications, don’t worry – Cheerson CX-10 is just fine. It boasts with up to 8 minutes… but realistically you’ll be getting around 6. Operating range isn’t half bad either. Distance of 30 to 40 meters is not just awesome for indoor flights but for outdoor sessions as well. First of all, I would like to make one thing clear – Yes, I realize this drone costs more than $20. But, it is listed here because you can find it on massive sales on a weekly basis. It easily goes 50% to 80% off which makes it way below the original price tag. With that out of our way, let’s get straight to business and see what the best drone under $20 can actually do! Starting off with its controller, the first thing you will notice is definitely the ridiculous design. If you aks me, it sort of looks like a childish version of Batmobile’s dashboard. It’s crazy… But actually, gets the job done with precision and intuitivism. The only features TX Juice AI Stunt drone has are auto take off and auto hover alongside one button rolls that it’s bragging around with. We’re not talking about altitude hold, but a mere gyroscope powered version that won’t amaze you with its accuracy. In terms of specifications, TX Juice AI Stunt has awesome numbers. Starting off with the flying time, its advertised for roughly 8 minutes. Unfortuantely, it falls short of that and is only capable of 5. Still, that’s an awesome number considering it takes only 30 minutes to charge with the provided USB charging cable. Lastly, the range – TX Juice AI Stunt can easily go over 50 meters in a clear area. What more could you want from such a cheap drone, guys?! Most of these models are pretty slow, trust me on that one. But, considering all of them fit comfortably in the palm of your hand, makes you think they’re much faster than they really are. 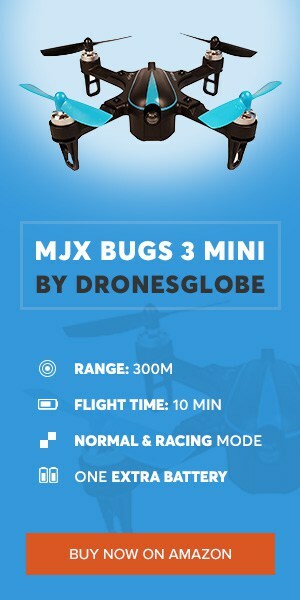 Luckily, that feeling is going to stick with you for the entire time flying these beauties… plus – since they’re quite durable as well, I suppose these mini drones are a win-win option! In terms of spare parts, the situation looks pretty good! Most manufacturers have spare props for sale and they’re priced extremely low. However, if you happen to destroy a motor, chances are you’ll have to purchase a brand-new drone instead. That’s because only a handful of under $20 drones have spare motors available. Prop guards, on the other hand, are there in an abundance so you will have no trouble finding those. Before jumping to the list, here are 3 awesome tips that’ll be of real help to first time flyers! When you first start flying around with your drone, you will have a rough time of getting by with the controls… But there’s no room for panic – if you do panic, you’ll only lose total control over your drone and crash it God knows where. Keep alerted to people around you! The last thing you want to do is hurt someone with these mini birdies. Prop guards can block off some damage, but you should still be on your toes for the entirety of your flying sessions. Even though we are talking about small LiPo batteries in most cases, it doesn’t make them any less dangerous when overcharged than their bigger, bulkier counterparts. Bonus tip – if you want to stay as safe as possible and make your drone last its maximum, just fly these fellas indoor. All of them are insanely small, allowing them to fit into small spaces and maneuver carefully around your furniture. Try it out – it’s awesome! Even rain can’t stop you from having fun! With TX Juice, I am afraid we have come to the end of our Best Drone Under $20 list. As you could see, there are more than a few great, and most importantly, affordable drones out there on the market. They might not have a whole heap of features or groundbreaking specifications, but what’s most important is the fact that they can provide you with a great deal of fun… and at the end of the day, that’s why drones are so awesome after all! And finally, I would like to thank you all for reading this and wish you best of luck while taking your baby steps into the world of drones… It might seem complicated at first, but with some good old trial and error technique I’m sure you’ll make it.